Every year, each child has a few Valentines that are not used for their class party. These Valentines are puzzles in disguise! Use clear packing tape to secure one Valentine onto the front of the envelope. Take an identical Valentine and cut it into pieces. The envelope can be used to store the puzzle pieces. It is a good idea to write how many pieces are in the puzzle on the back of the envelope. The number of pieces you cut should be determined by your child’s age. It should be age appropriate. The younger the child, the less pieces. The older the child the greater number of pieces you can make. Older elementary school children would love to make these puzzles themselves. 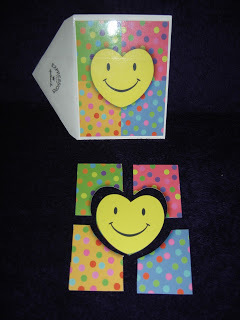 Puzzles can be made with any greeting cards or matching photos/pictures. Puzzles are great for cold Winter Days! They help chase away boredom. They are good for times when you have to wait and are a great work-out for your brain. Puzzles are a great self-correcting learning tool. They aid in eye-hand coordination and help children learn to categorize and organize pieces. While doing puzzles children are able to classify and label the pieces. Fine motor skills are practiced as well as encouraging and expanding social skills. When a child works on a puzzle until completion the child is developing persistence. Once the puzzle is solved the child can feel a sense of accomplishment which boosts his independence and self esteem. Children use adaptable thinking and deductive reasoning skills when they find different ways to put the pieces together. They gain the ability to think abstractly when they are able to see negative space, like the space where a puzzle piece may fit, and figure out what type of shape would be needed to fill that space. Puzzles offer a host of valuable educational benefits that support child development and they are so easy to make! Have fun creating your own unique puzzles! President’s Day Exploration and Fun!